The film for July for #FoodnFlix was Popeye, the 2003 version with Robin Williams and Shelley Duvall. Food n Flix is a group of bloggers who watches a film, uses the film to get inspiration to cook, and posts the inspiration on the blog. My inspiration was Impossible Spinach Quiche. More about that later! Based on the long-running comic strip created by E.C. Segar (and less on the animated cartoons created by Max Fleischer, which were decidedly different in tone and approach), Popeye follows the sailor man with the mighty arms (played by Robin Williams in his first major film role) as he arrives in the seaside community of Sweethaven in search of his long-lost father. Popeye meets and quickly falls for the slender Olive Oyl (Shelley Duvall, in the role she was born to play), but Olive's hand has already been promised to the hulking Bluto (Paul Smith), of whom Olive can say little except, well, he's large. Eventually, Popeye and Olive are brought together by Swee' Pea (Wesley Ivan Hurt), an adorable foundling , and Popeye finally meets his dad, Poopdeck Pappy (Ray Walston). Direct or Robert Altman in no way tempered his trademark style for this big-budget family opus, crowding the screen with a variety of characters and allowing his cast to overlap as much dialogue as they want. 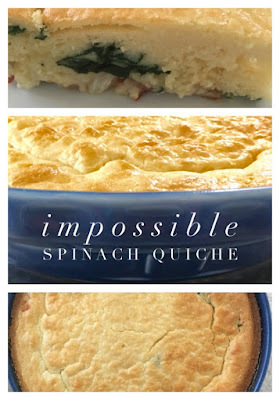 So of course, when you think of Popeye you think of spinach (or hamburgers, depending...) and then I started thinking about a quiche recipe I used to make all the time! Growing up in the 60s and 70s presented a lot of opportunities for me to learn about quick cooking. One of those quick cooking tips was Bisquick. Remember Bisquick? There was a yummy quiche recipe that was on the back of the box that I loved to make. I wondered if I still had that recipe and sure enough, I found it in my recipe book, written in my still teenaged handwriting! I've included the original recipe but I've lightened it up considerably and put those adjustments off to the side! Sprinkle the bacon (spinach), shredded cheese, and diced onion (in that order) evenly over the bottom of the pie plate. Beat the eggs with the salt and pepper. Add the Bisquick and beat until smooth. Pour over the ingredients in the pie plate. Bake for 35 minutes or until a toothpick inserted into the center of the quiche comes out clean. I hope you enjoyed the review and the quiche! If you are interested in joining, check out the monthly movies here! One look at your list of ingredients and I can tell this is going to be delicious! What a perfect dish for a brunch! Oh I need to try this. I love spinach and I love quiche. What a perfect combo! Foodnflix sounds like a great way of making cooking fun. Its great that you were inspired by Popeye. I have made this before and you are right- it is delicious! Anything with bacon is welcomed in my tummy. Yum! We make quiche a lot in our house. My kids used to call it egg pie :-) Spinach onion and mushroom is my favorite! Happy Thoughts of Home girl. I love quiche! It's so filling and you can put anything in it. I make it every other week. How cool is that to find inspiration in a movie to cook!!! I have never had quiche before, and I love spinach…so this looks good to me. I love mushroom quiches. I bet I'd love spinach in it too. Pinning this. Thanks!! Clearly...nothing is impossible with this recipe. ;) I am going to try this on my family for Sunday brunch. This looks amazing. I lvoe me some Quiche especially if it's loaded with veggies. I love quiche. That looks amazing. I still make impossible pies too. Thanks for the memory and very fitting that you chose a recipe from the same time period of the release of the movie. I have a book my aunt gave me when I was a preteen. It holds recipe cards and has Betsy Clark's waif on the front. (Remember those cute little things?) I enjoy revisiting that too. Love the additions (and subtractions) you made to the original dish, Terri! OMG blast from the past: Bisquick! What a great quiche and so cool you had it written from so long ago. Drooling! This recipes is perfect for the movie and there's bacon, so it must be amazing!